BERLIN (AP) — Hungary’s populist prime minister described members of a European Parliament group calling for his party’s expulsion as “useful idiots,” saying in an interview published Sunday they are playing into the hands of left-wing opponents. Discussion over whether Prime Minister Viktor Orban’s Fidesz party should remain part of the European People’s Party intensified after the Hungarian government started a public ad campaign last month opposing European Union leaders on migration. Orban said in an interview with Germany’s Welt newspaper that European People’s Party representatives that want Fidesz kicked out were “useful idiots” for the left, using an expression commonly attributed to Lenin. “While they believe they’re fighting in a spiritual struggle, in fact they’re serving the power interests of others — indeed, of our opponents,” Orban said. 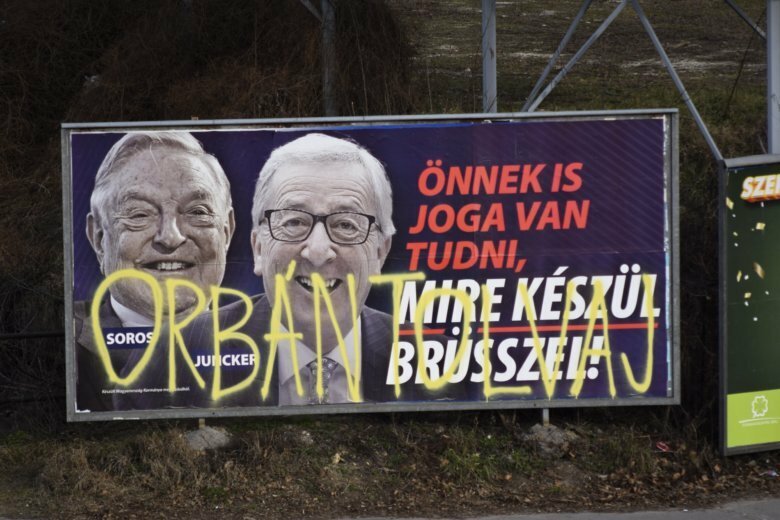 Orban said Hungarians don’t consider the posters anti-Semitic. “I can’t do anything about the fact that George Soros is a Hungarian of Jewish origin,” he added. Soros has been the target of various Hungarian government smear campaigns in the past few years. The European Parliament voted in September to launch a sanctioning process over the Hungarian government’s perceived shortcomings regarding the rule of law and European values. The procedure could lead to Hungary losing its voting rights in the EU. In his interview with Welt, Orban seemed to offer a possible compromise, which on closer inspection hardly changed his position on the migration policy campaign. He told the newspaper that government ads against Juncker would soon be withdrawn. However, he said Fidesz would be launching its own campaign, with European Commission Vice President Frans Timmermans replacing the EU chief. Timmermans is the lead candidate of the Party of European Socialists to succeed Juncker after May’s European Parliament election. He has been highly critical of Orban, and Orban has repeatedly expressed his disdain for the Dutch politician. Weber linked to his interview with Germany’s Der Spiegel magazine, published Friday, in which he said “Orban badly damaged the EPP” with the Soros poster campaign. In the interview, he said Orban had a “weak” approach that relies on “scaremongering” instead of persuasive advocacy.